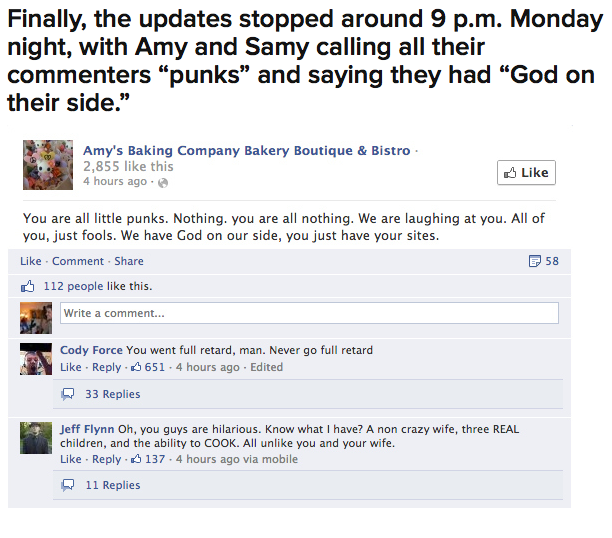 5 things for Amy’s Baking Company Bakery Boutique & Bistro charming owners to do besides rant on Facebook. So today’s big news… is a batshit crazy couple from the USA went, well, batshit crazy. Big time. Meet Mr and Mrs batshit crazy. 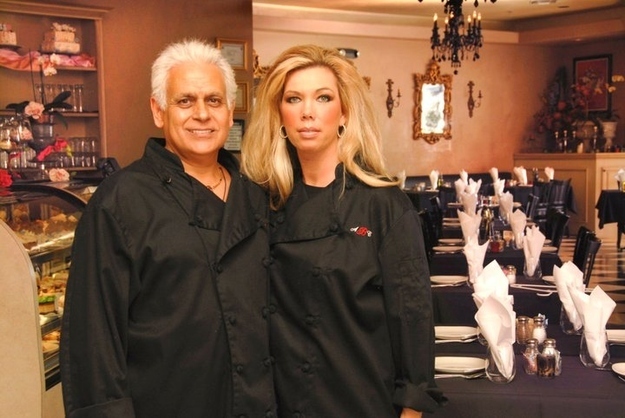 This enchanting couple were featured on an episode of Gordon Ramsey’s Kitchen Nightmares, and even he got rid of them because they were too crazy for him! Last night they had an epic meltdown on Facebook, posting, yelling, screaming IN CAPITAL LETTERS at anyone who disagreed with them. They are god-fearing American’s ya’ll, and we are just devil children, not understanding their plight. 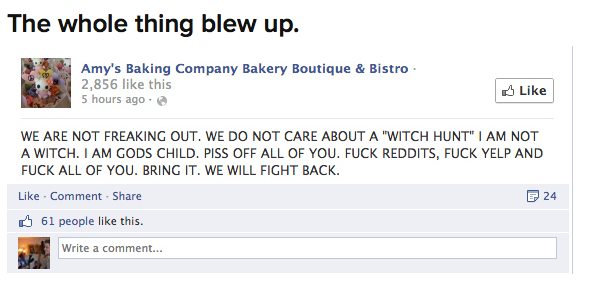 Here are a couple of examples of their amazing amazing posts. ISN’T IT AMAZING HOW WHEN YOU READ CAPITAL LETTERS YOUR MIND AUTOMATICALLY MAKES YOU YELL IT OUT LOUD IN YOUR HEAD. 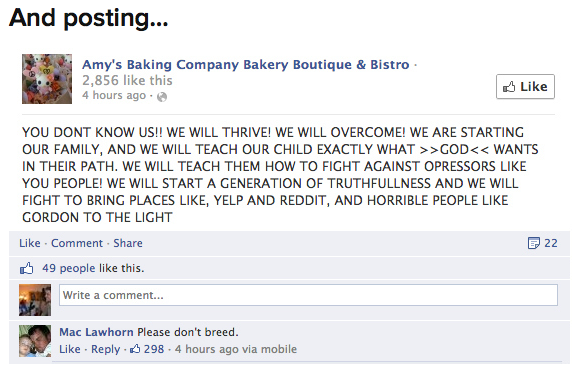 Um… Aren’t they meant to be a bakery? I thought people that baked cakes were nice and kind and had fluffy hair that bounced when they walked? While reading this hilarious and rather sad meltdown (YOU CAN READ IT HERE), it came to me that for their next venture (as surely this one is going to collapse under the weight of all those capital letters) they might need some tips on how to avoid the next meltdown. So here are my top 5 tips on how to avoid ruining your brand on Facebook (that goes for relationships/friendships too). 1) Throw away your laptop, not your dignity. If you are pissed, and I mean REALLY pissed – like throw-your-laptop-out-the-window-pissed, then throw your bloody laptop out the window. Even a MacBook at $3,000 is cheaper to replace than your ENTIRE company (and possibly, marriage/relationship/friendship.) Rather than taking it out on the public, take it out on that bloody device that links you to the public. Smash it. SMASH IT TO PIECES!!! 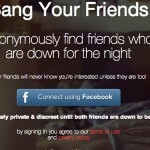 2) Get drunk – offline. Everyone loves a drinker. Have you not seen 28 Days with Sandra Bullock? The best part of that movie was when she got hammered at her sister’s birthday party and fell on the cake and ruined it. (I’m kidding. I love that movie, I always cry when I watch it. And how like HOT is Viggo Mortensen like before-he-was-famous. Dayum.) Anyway, back to the drinking. Go get hammered. Imagine your hourly wage TIMES the amount of hours you would have ranted at these ungrateful ungodly customers and spend THAT amount on booze out a bar. That hangover will still be better than the alternative. 3) Have a cry you cry baby. Everyone cries, there is no shame in it. Throw yourself down on the ground and chuck the world’s biggest tanty – screaming about about how noone understands you, and everyone hates you. Getting physical when angry is underrated. I am not talking about just throwing a laptop here. No I mean start punching yourself, yelling at yourself, pulling your hair out etc. I mean showing up bald for work the next day because you have pulled your hair out, is STILL better than the alternative. 5) And finally, how about you just shut the hell up. If you are at the stage where Gordon Ramsey – the king of dysfunctional areseholes can’t even deal with you – then you are too far gone even for god to save you. Whether you are a god-fearing American or not. So next time you are about to go batshit crazy, take a moment to reflect on my 5 top tips. Perhaps it could help you. I’ve read quite a few articles/blogs today on this and Dani, yours was by far my fav. We had a social media meltdown over here a couple of weeks ago and I was ranting at the way the company/brand handled it by disabling comments and ignoring the problem, hoping it would go away – now I’m thinking perhaps it’s not always a bad option!